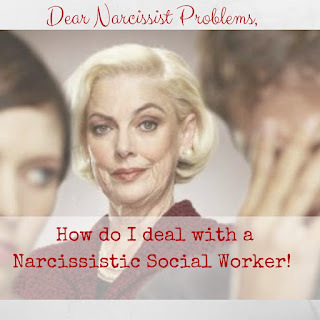 Narcissist Problems: Dear Narcissist Problems, "Narcissistic Social Worker"
Dear Narcissist Problems, "Narcissistic Social Worker"
I love social media, thank you for your site. When I explain to others what I experience with a narcissistic social worker a masters narcissistic social worker (that should not have a license) people look at me like I am crazy. I would like more information for education helps me to understand the craziness. 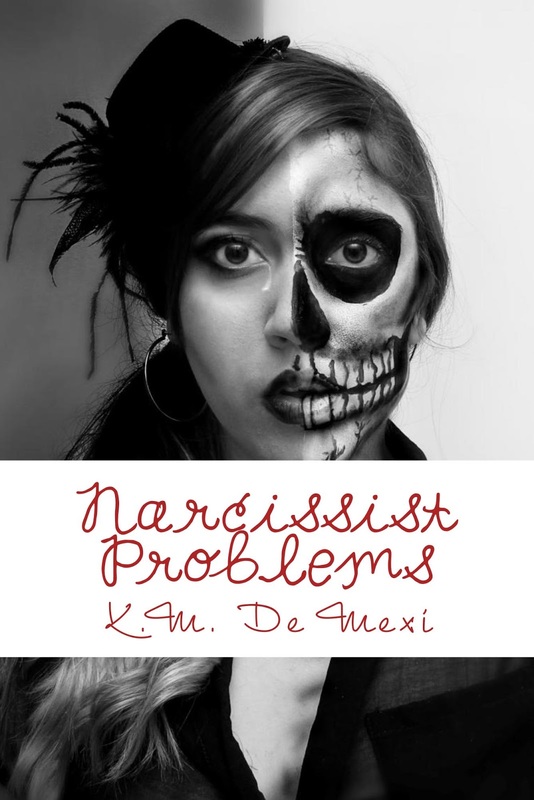 Need resources on how to deal with a Narcissistic Social Worker! I can only imagine what you are going through if you are dealing with a narcissistic social worker! As far as educational materials dealing specifically with a narcissistic social worker I'm coming up short handed. However! There is a lot of information on how to deal with an investigation, how to deal with false allegations, and how to deal with legal kidnapping. Unfortunately for us what we consider narcissistic abuse is actually common practice within the Department of human services. I'm sure that some good people with noble intentions originally set out to be social workers to save children but all of those good intentions fly out of the window when combined with state policies. There is a conflict of interest happening within our civil court system and specifically within DCFS where false allegations are encouraged by narcissistic social workers and used against parents with little to no evidence as a means to legally kidnap children. I think we are all in agreement that throwing a child into the foster care system rather than working with the parents who may have issues is not only not in the best interest of the child but it's also not in the best interest of our species. The late Senator Nancy Schaefer was an advocate for parents and families dealing with social services. She did a great job explaining what happens to families dealing with DCFS. There is a huge problem in our country in regards to the corruption and problems withing the DCFS system so outing one narcissistic social worker would be almost impossible because their tactics are widely accepted and used by the entire system to destroy children and families. I'm glad this page has helped but I highly suggest doing a search on Facebook for groups that deal directly with CPS and DCFS corruption. Don't Give them access to any of your records! Record and document all interactions! In the meantime, make sure that you record all interactions with this social worker. Inform them that you will be recording the conversation or face to face meeting if required to do so by law. Another option is to refuse any meetings without your lawyer. If they want to speak with you then ALWAYS speak with your lawyer. Stop them and say, I need to talk to my lawyer first. Then call your lawyer. I know attorneys are very expensive but this is one situation where you should sell your house, car, pawn your belongings, and do whatever you need to come up with the money to pay a lawyer because not having a lawyer could cost you your family. Don't sign anything without showing it to your lawyer first. If you have already signed something then send them a certified letter in the mail requiring a signature that states you are recinding, an email that you are recinding, AND a phone call. Then save the records of all three so they can' t later say they collected evidence before you recinded your signature. When you recind make the letter quick and to the point "I did not understand what I was signing, I signed under duress, and I was told that if I didn't sign the document X Y and Z would happen to me or my children". Make it clear that you will no longer be signing anything without a lawyer first looking over the document. I'm not sure exactly what is going on in your case or with this social worker but I can only imagine that you are being threatened with your custody of your children. Make sure that you stand your ground, never admit to anything especially when you are innocent! A great way parents get duped by DCFS is signing an agreement to services. In the eyes of the government by you signing that agreement you are agreeing to being guilty of whatever they are accusing you of. DON'T SIGN ANYTHING, EVER! These people might act as though they are above the law but they are not. If you don't know your rights as a citizen of this country then you might as well not have any. They need probably cause, they need evidence so don't give it to them! Make them take you to court but you better be sure that you are not giving up evidence that might be used against you because it will be even if its something innocent it will be twisted into you being a monster. If you give them an inch they will take a mile. Stand your ground and know your rights. Specifically, know the 4th and 14th amendments and practice them!